Methanol is a hydrogen carrier for fuel cells and its chemical transformations are of great current interest. Methanol oxidation by vanadium oxides is well studied, hence, serves as a good measure for catalytic activity. Arrays of VO2 nanowires grown on r-cut sapphire prove to be unique for the in situ catalytic activity tests. 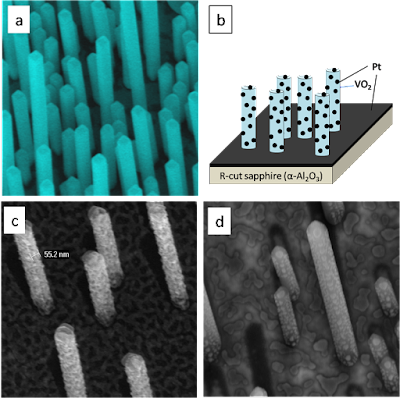 Here, we present size and morphology dependent activity of Platinum coated single crystalline VO2 nanowires in methanol oxidation reactions using Grazing Incidence Small Angle X-ray Scattering (GISAXS). Our findings show an unexpected sintering behavior of Pt at temperatures as low as 200 °C.